Would it work fine for XP boot? I think yes, boot XP SP3 will work on this nvme disk because nvme 1.3 compatible. Interesting, to compare this nvme disk Adata XPG SX8200 to samsung 970 pro. Price in germany 200 Euro against 300 Euro for 970 pro each 1TB. Can this work for Intel Optane modules : LINK ? They don't have specific driver, however they are NVMe 1.1 devices and use generic Microsoft driver. Both Win7 and Win10 nvme build-in drivers will work with them. Edited by agent_x007, 4 weeks ago. that works with XP (floppy F6 method, can be integrated via nlite). This is a real interesting thing, I never heard before of it. Intel comes with the right idea. Win7 has no built-in NVMe driver, but you can integrate the MS NVMe Hotfix into the Win7 image. @Fernando1 True. I meant it more as "can be done easily", compared to this. @Dietmar I want to install Windows XP on Optane module directly (NOT paired with HDD). Since TRIM support is... problematic under WinXP, I wanted to use memory that doesn't need TRIM to function (this is where Optane comes in). So, is it possible to boot Optane directly ? Secondary question : How to boot Windows XP from UEFI "enabled" platform - ie. a GPT drive ? No need for TRIM on the Optane nvme disk. 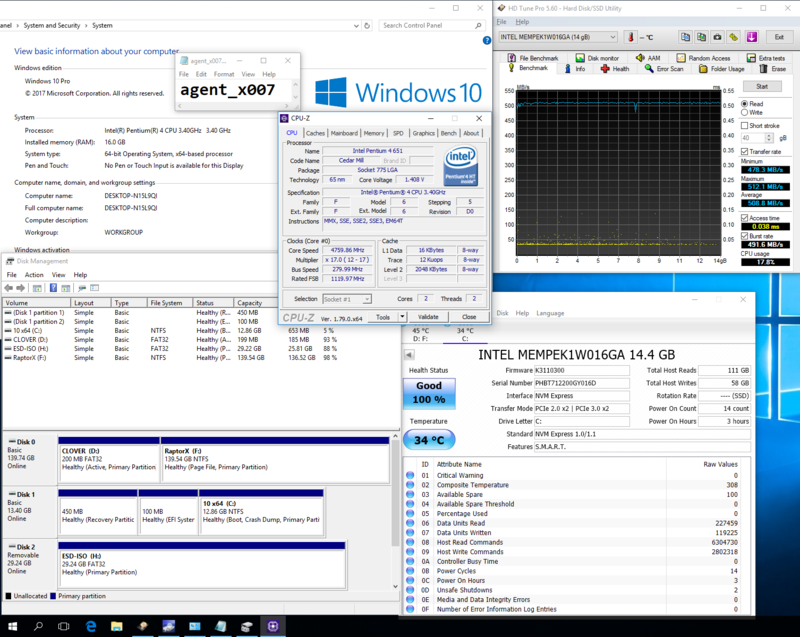 I think, XP SP3 can be installed and boot via nvme.sys from Kai from the Optane device. "How to boot Windows XP from UEFI "enabled" platform - ie. a GPT drive ?" I have a driver for XP, that can use GPT drives. But I never tested it for boot. I wish you good luck. I will try booting XP from 32GB optane module next week. I recommend adding GTX 980 Ti or Titan X (Maxwell) as GPU. Maybe those useless Optane modules (16-32GB), can actually help legacy community. GPT drive and BIOS or GPT drive and UEFI? With GPT drive and BIOS (or CSM) you cannot (i.e. you can boot with a couple tricks but then the NTLDR won't understand the GPT and fail, unless you use a Hybrid GPT/MBR or a ramloading of sorts). With GPT drive and UEFI you cannot (actually you can, but it won't work because UEFI is either 32 or 64 bit and it must match the OS bitness), your UEFI is 99.99% probable 64 bit and won't expose an EFI32 that is needed for a x86 (32-bit OS). It's more of an experiment really - to simplify BIOS/UEFI settings, and I don't want 64-bit XP. I got X79 MB with NVMe boot support (added via mod NVMe), and I can use Clover from HDD/SSD to bypass any non-UEFI BIOS booting limitations (if need be). In case of UEFI and GPT, can I simply use Clover (it should have 32-bit support ? ), together with 32-bit Windows 7/10 loader ? The windows 7/10 loader, what do you mean? None of them will boot XP, because XP is booted by NTLDR, and NTLDR cannot read GPT, and needs BIOS. Being "Longhorn", i.e. midway between XP and Vista, it is a sort "cross-breed" between NTLDR and BOOTMGR (or BOOTMGR.EFI). Still, a 64 bit EFI/UEFI will only boot a 64 bit OS, and a 32 bit EFI/UEFI will only boot a 32 bit OS. Personally I believe that it is possible to write an emulation layer that might allow that, but I don't know any, and even if someone might write one, it is more likely that it would work only for booting 64 systems from UEFI 32 bit. I mean, all modern PC's (desktops and laptops) have 64 bit processor and 64 bit UEFI, but there are a number of (usually small) tablets that do have 64 bit processors but have a 32 bit UEFI, so it is more likely that someone with tackle the actual problem and not the non-problem. I mean, if you have multi OS boot (like, you installed XP, and then Win 7), Win 7 bootloader gives you an option to boot Win XP - "Legacy OS", and I can use 32-bit Windows 7 or 8 to do this. I thought that I could use that as bridge between NVMe native booting from UEFI side (via Win 7), and Legacy XP boot with NVMe drivers. I mean, if you have multi OS boot (like, you installed XP, and then Win 7), Win 7 bootloader gives you an option to boot Win XP - "Legacy OS". I thought, that I could use that as bridge between NVMe native booting from UEFI side (via Win 7), and Legacy XP boot. Not "bad" (nor "good") only "not possible". BIOS does not care if the processor or the OS is 32 bit or 64 bit. UEFI is EITHER 32 bit (and will only load a 32 bit OS) OR 64 bit (and will only load a 64 bit OS). The option in a dual boot Windows 7 and XP for XP actually allows BOOTMGR to chainload NTLDR. Does anybody knows where to get the latest OFA NVMe driver version, which supports Win10? The latest version I found is v1.5.0.0 Build 157 dated 04/07/2017. For me it seems, that the Open Fabrics Alliance has stopped the development of NVMe drivers for Win7/8/10 already in 2017.
on Intel Optane 32 GB MEMPEK1W032GAXT. Any additional tweaks needed ? Or is it just nvme.sys and off you go ? no additional tweak is needed. "Full ACPI support for Windows XP" - starts to be a problem at Haswell and later platforms, right ? Boards with XP as officially supported OS do not need patching/tweaking to make it work (?). manufactures start to use ACPI 2.0 in Bios DSDT list. and will install XP SP3 on nvme on it. 2) Add SP3 and KB onto it. Adding Dell drivers does work (I used txt mode, added all of them). Edited by agent_x007, 3 weeks ago. more difficult than to copy a working XP. For example you have to integrate storport.sys to the CD also. 1.) Install XP SP3 to an harddisk. Best way is to install from CD. 2.) Copy the file storport.sys (vers. 5.2.3790.4173) to folder C:\WINDOWS\system32\drivers on your XP harddisk. 3.) After testing, that all is ok with this XP, put the nvme device in. 4.) Click on the folder nvme, where the files nvme.inf and nvme.sys (vers 1.3) from Kai are in. 5.) The nvme device is recogniced. Dont forget to align the nvme device with 2048 sectors preceding partition 1 with AOMEI. After copy, disconnect your harddisk from compi before first boot from nvme!